Your courage matters: that you pray instead of panic, love instead of hate, help instead of hide. Live a sermon people are dying to hear. In light of all the war, terrorism and natural disasters, how to you keep hopeful and courageous in the storms? Quite honestly, left to my own devices, I wouldn’t. I’d been running around screaming and crying like a chicken with my head cut off….without Christ. Coz that’s how I coped with intense situations before I encountered Jesus. I panicked, looked stressed, and so bottled up my fears on the inside i couldn’t help but act out. Nowadays, when the world seems to be bent on destroying itself, and there is nothing positive in the news? I pray, even if its only moans, or silent tears. I seek comfort in His Presence. I make time to rest, to connect with loved ones. I ask Him for forgiveness and His healing to flow as He draws near to those in the war zones of destruction and affliction. I continue to hold onto the One who is my eternal Hope, allowing my equilibrium, my foundation to be founded upon Him. And equally important, I spend time soaking in the Word. It doesn’t have to be a long section of scripture to speak to us. Sometimes a few words anointed by Holy Spirit can reignite our love for Him as we see His devotion for us more clearly. He is crying over His people. Coz all people were made by Him in His image, and He adores each one whether they know Him or not. So if you are overwhelmed to tears over a situation near and dear to your heart? Serving God wherever they went as His Living Word, a sermon wrapped in flesh & bone. Sharing His heart with those who are so fearful, their hearts are skipping a beat. Speaking His Words of comfort and hope when all looks topsy turvy. Today, walk out your faith. 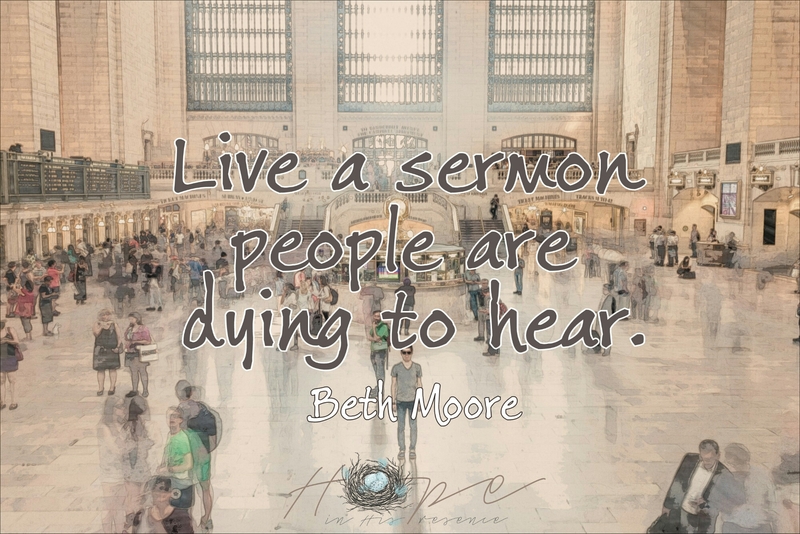 Become the living sermon those around you need to see and hear. Rely on Holy Spirit’s leading so deeply you will be struck by wonder at what He will do through you as you live fully dependent upon Him. The world may not yet know how much they need Him. But He does, and chooses to use His willing vessels to be the very Message-ers to deliver hope to hurting hearts, those who are dying inside without Him. Go be the Living Word in action. He is with you as you do, for it is His Presence and Word alive within us who empowers us to do so!